Please excuse grammar, text by non-English speaker. CZ Document Converter COM is a component/object designed to assist you, the developer, to quickly add a document conversion utility to your application. It can be called from VB, VC, DELPHI. It is a batch office document converter that convert between doc, html, rtf, text, WordPerfect and Works for windows etc file format that that you can open in Microsoft Word. You can convert doc to html, html to rtf, rtf to html, doc to text, html to doc, text to html and html to text etc, you can convert a lot of files once time, saving your time! Furthermore, we provide some VB and DELPHI examples. Although you may not be using Visual Basic and DELPHI, the approach for all development environments will be similar. CZ Document Converter COM is a component/object designed to assist you, the developer, to quickly add a document conversion utility to your application. It can be called from VB, VC, DELPHI. It is a batch office document converter that convert between doc, html, rtf, text, WordPerfect and Works for windows etc file format that that you can open in Microsoft Word. You can convert html to word, html to doc, html to rtf, text to doc, rtf to word and rtf to doc etc, you can convert a lot of files once time, saving your time! A. batch convert html to word, html to doc, html to rtf, text to doc, rtf to word and rtf to doc files quickly. B. support COM interface and command line arguments. E. fit to convert so much as over 1 million files in folder, you need not wait at all. 3.Of course, you must install Microsoft Word 95 or higher for windows. What's New In CZ Document Converter COM? Release CZ Document Converter COM V1.0 Build021120 support convert html to word, html to doc, html to rtf, text to doc, rtf to word and rtf to doc between office document (doc, rtf, html, text format and almost any other format that microsoft word will support), beautiful GUI interface, support COM interface and command line run, convert the files in subfolders. Can CZ Document Converter COM support ASP? No, CZ Document Converter COM do not support ASP. After runing cz document converter, you can simply press the "add files" button or the "add folders" button, then select the files you want to convert to batch conversion list with ctrl or shift key, and press the "convert" button, in a short time you will have finished conversion! file path the path and files want to be converted, this parameter must exist. /f:<dest file format code> destination file format code, this parameter must exist. >8 other file format your office word can support, you can find it in CZ Document Converter COM's gui, please see following red frame. What's CZ Document Converter COM Properties? Indicates whether the dialog of CZ Document Converter COM show. When set to true, the dialog show, otherwise the dialog hide. You can use Visible property to check the status of the dialog. Boolean. The property is read/write. Returns true if the dialog show, or false if not. Default is true. What's CZ Document Converter COM Methods? Convert word doc files in folder to pdf files. SrcFilePath: String specifying source file path, for example "c:\*.doc"
DestFilePath: String specifying destination file path, if blank then convert to current path. IsSubFolder: Boolean. Flag that indicates whether convert file of sub folder. If true, convert file of sub folder. If false, do not convert file of sub folder. String, return the conversion error reason, if return is blank, then convert successfully, otherwise is error reason. How to use COM component/object in DELPHI? How to use COM component/object in VB? Does this converter convert quickly? Yes, CZ Document Converter COM can convert between word doc, html, rtf, text files very quickly. Does this converter support word xp? 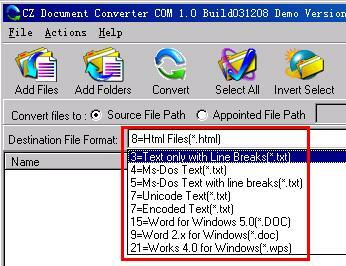 Yes, CZ Document Converter COM supports word xp. Is there a batch process available? Yes. CZ Document Converter COM can support batch conversion between doc, html, rtf, text files, so much as over 1500 files. Can this converter convert many pages in a document file? Yes. CZ Document Converter COM can convert very big document file, so much as over 5000 pages in a document file. I am trying to use your Document Converter product (cz-docvt) to convert HTML to RTF via the command line, but can find no way to tell it the source document type; it seems to just copy the HTML and do no translating. You need not to know the soure file type, and you only set the destination file format, please add /f:6 to your command line, then you can get rtf result.